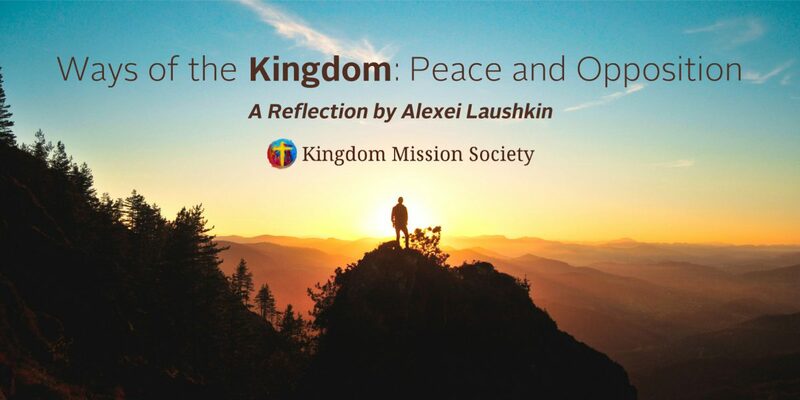 As we prioritize seeking first the kingdom of God, we are bound to experience two corresponding realities: a growth in our sense of peace, and at times an unusually strong opposition to every step that we try to take forward in this path. The opposition is usually to be found at the point where we are struggling the most; at the intersection of our desire to seek first the kingdom and our fear in doing so. The opposition is often the strongest as we reach the verge of a breakthrough. The peace is to be found when we orient our lives and hearts towards God in obedience and perseverance, despite the challenges and opposition that we may face. Kallistos Ware gives us an important insight in seeking first the kingdom. In his book The Orthodox Church, Ware describes the Christian experience as the “way of affirmation” and the “way of negation.” He explains that both of these “ways” are necessary to the Christian life and to seeking first the kingdom. Seeking first the kingdom of God is an orientation of the heart that must be cultivated and protected. There are corresponding practices and disciplines that we must apply to our lives. We don’t follow these practices so that we can merit grace but in order to bring ourselves into the inner work of cultivating the heart towards the good, and to bring us to an encounter with the Lord who is always ready to meet us. Cultivating a kingdom-first orientation of the heart is hard work, especially when we allow our minds and hearts and thoughts to drift unchecked. Your first thought upon waking up probably isn’t always “How can I orient myself toward God today?” or “I naturally feel like I want to start today in prayer.” Instead, it’s probably an unstructured jumble of thoughts like, “I should check the news… and the weather… if I could just go back to sleep… how much time do I have before I have to head out the door?” and so on. This drifting sea of thoughts actually robs us of the disposition needed to freely seek first the kingdom. And even if you can’t identify with the morning experience, you would likely agree that most of us feel like our grace tank “leaks,” so that even when we start our day out on a great foot, our good disposition is gone or changed for the worse by the middle to the end of our day. Taking our thoughts captive to the obedience of Christ and establishing a stable and healthy spiritual disposition requires a lot of intentionality, effort, and sometimes sacrifice. Seeking the kingdom isn’t just about cultivating a more stable and healthy disposition, though that is an important good in and of itself. It is also about creating more space for yourself to prioritize the kingdom and aligning your actions with kingdom values. You might start somewhere small, like cultivating a 15-20 minute morning prayer life, following a liturgy (The Book of Common Prayer, for example), or starting other regular practices of worship and devotion. The point is to adopt a regular practice that helps you focus and offer yourself to God in a moment and time that is intentionally based on where you are at currently with the Lord. From there, as you grow in peace, you will run into opposition. That opposition may be intense, and it is important to remember that our battle is not against one another but against the spiritual powers of this world, our flesh, and the devil (Ephesians 6:12). Temptation, discouragement, and sin will work on all of these fronts to stop our forward momentum. Scripture is very specific and detailed about the kinds of opposition we will face as we follow Christ and pursue the kingdom. Jesus said that the Gospel would divide families (Matthew 10:35) and that the world would hate and persecute his disciples (John 15:18), Peter said “don’t be surprised at the fiery trials you are going through, as if something strange were happening to you” (1 Peter 4:12). The opposition is both personal and familial, which signifies that this kind of opposition is actually an aspect of following the kingdom. In these moments, we have the mighty name of Jesus to call upon and proclaim (Philippians 2:9). I encourage you to learn the Jesus Prayer, even a small portion, to say in these times of opposition. “Lord Jesus Christ, have mercy on me, a sinner.” Many believers throughout the ages have found the strength to face all kinds of opposition by calling on Jesus with this prayer. Realize that the enemy’s intention in opposing you is to cause you to turn back from this way of seeking Christ by disturbing your peace, disturbing your frame of mind, and weakening your courage. But realize in the midst of the opposition, that what was meant for evil (to stop your growth in the Lord), God can and will use for good (Genesis 50:20). Let us remember the Apostle Paul’s reminder in Romans 8:28, “And we know that in all things God works for the good of those who love him, who have been called according to his purpose.” As we abide in this truth, we can say of the challenges and oppositions, “Lord I trust that what was meant to create difficulty for me, you are using to actually create life and strengthen me.” This is how to count it all joy and how to rejoice in all circumstances. As we grow in trust of the God who provides for us specifically, with all of our individual nuances and complications, then we also begin to be strengthened as we grow in the kingdom. Though we will certainly face challenges, our obedience and perseverance in the midst of them will bear the fruit of peace in our lives.